I imagine it wending it's way here, over hill, over dale, through bush, through briar (Shakespeare, just the last bit; probably remembered it wrong). I'd love to be more specific about the landscape in these visions: corn fields? meadows? mountains? It's due to arrive Monday. I've managed to refrain from believing it might be here sooner. Good thing, I would have been sorely disappointed. 2 more days I can wait. It could be late, though... but I won't think about that today. I've had plenty to distract me. 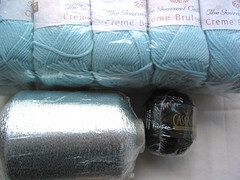 The Jacquard Acid Dyes I ordered from Dharma Trading arrived! 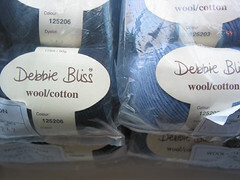 I ordered the primaries and black, though just what are considered primaries is a subject worthy of debate. Half again of the above ended up on the newspaper. A mess! 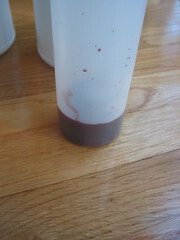 The lip of the larger container is not conducive to pouring; we're actively pursuing solutions chez 2LN. Well, maybe just the funnel... Except for the turkey basters, all at the Dollar Store! 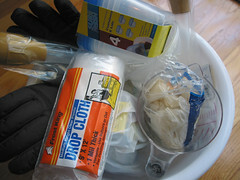 Drop cloth, plastic storage containers, a measuring cup, latex gloves and a large funnel set, and the plastic bowl. A buck per! And the turkey basters were only $1.76 at Shaw's. The black gloves cost much more than a buck, they were bought a year ago. 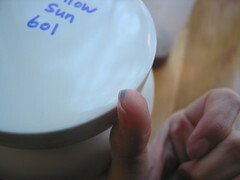 due to the blue Sharpie I used for marking the containers. 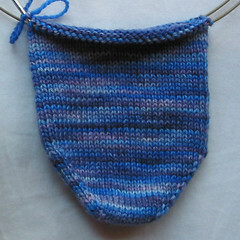 I haven't been in a blocking mood while fighting the cold/flu. 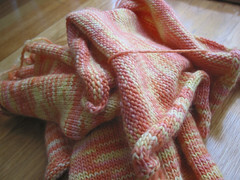 And actually, I'm thinking of seaming and then wet blocking, since I want to give it a quick wash before wearing. I usually block then seam; at last check (when I started the project) I was getting gauge so it's just to get the rolly polliness ousted. 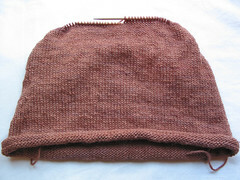 If the seaming is too much of a pain, especially at the shoulders, then I'll have to block. 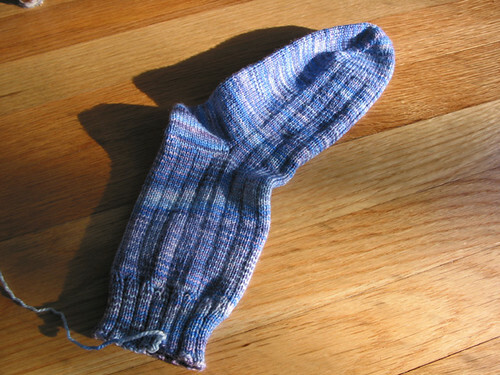 Since I couldn't pour out any more dyestuff, I worked on Gram's Socks. At last check in (11/21), I was a few inches past the heel (ie, almost done), but had to rip back because it didn't fit (last sock photo). It fit fine up to the mid-foot; from there, her foot gets wider, which is something I couldn't have foreseen. I am horrible at dealing with complete setbacks like that. 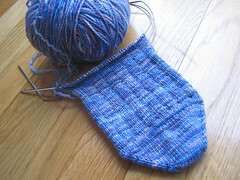 So the sock languished and I focused on holiday knits. Well, I've had just over 2 months to brood and mope and brainstorm. 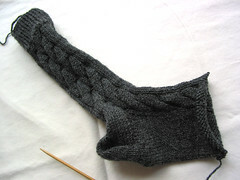 Last night I finally ripped back to the last set of toe increases, added one more set of increases, knit 5 rows plain, and then increased 1 stitch every 4 for 4x1 ribbing. 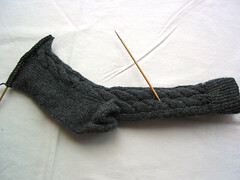 I figure ribbing will be most forgiving, and adding the extra stitches will hardly affect the finished silhouette, while adding plenty of room to stretch. 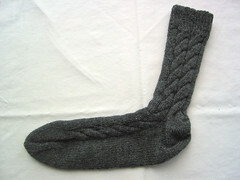 I imagine that even with her currently swollen feet, she would be able to fit into these! 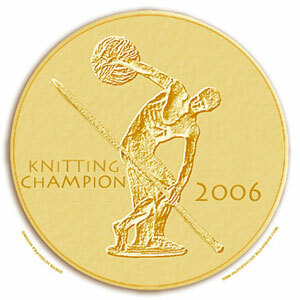 The added bonus is the knitting is more interesting; every other needle I have something to do! 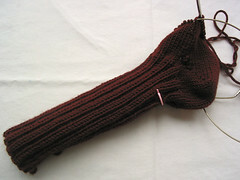 Plain socks at this gauge is not for me. 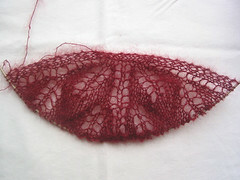 While pondering all this, and catching up on some blog reading, I saw Adrian's finished Kiri, and noticed she had made hers out of Koigu KPPPM. 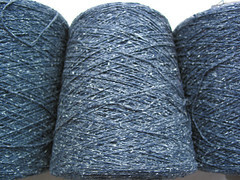 I had been thinking about making a Kiri or Birch for a while, you know, hop on the bandwagon, and had secured 3 balls of Kid Silk Haze in a swap a few months back. Somehow the timing never seemed right. 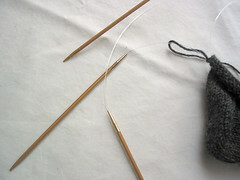 And, while the Yarn Harlot's been known to call it Kid Silk Crack for its addictive qualities, others have been less than impressed with the knitting experience, so I've been wary. 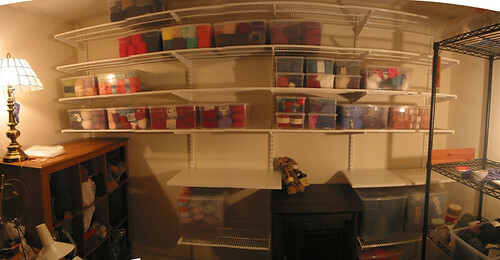 I wondered what yarn from stash I could use. That's the beginnings of Kiri using the KSH. It all happened so fast, I can't explain it. I think it started with, "Let's just see..."
Notes: These only took me 9 years to finish, not too bad, hahahahaha. 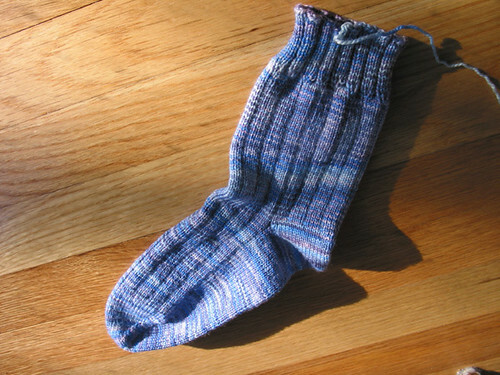 The first sock was finished 7/24/97. It was on the tight side, so I didn't start the second. 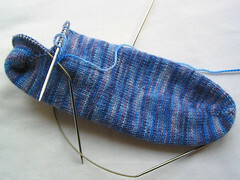 I finally started the second sock a few years later, but was getting a very different gauge, so I dropped it. 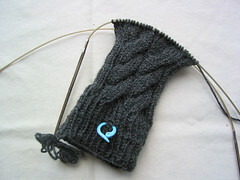 Last month, as part of my WIP Management efforts, I picked it up again and finally finished the pair. The second one is even tighter than the first, but once they're on, it's not noticeable. They're snug and warm, I've been wearing them all day, and I love looking at them. 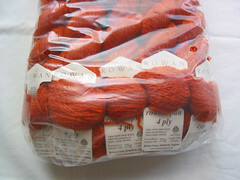 Well, I haven't looked at them much, but I love knowing that they look wonderful with their cabley goodness. Pattern: my own: c.o. 38 sts. 2x2 ribs ad nauseum. Notes: I bought this cashmere as my birthday present to myself, but it took a while to make it to the needles, and then just as long to knit. 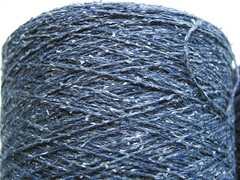 2x2 rib is not fun, but on the plus side, this yarn is so very soft and luscious, it's as soft as angora without the bits of fluff escaping, without the allergic reaction. 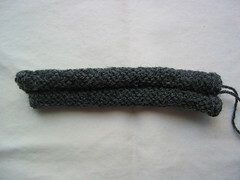 If I were to do it again, I would probably add a few more stitches to make it just a bit wider. Otherwise, I love it. 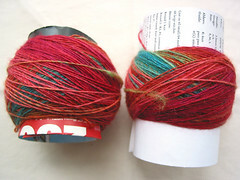 Found beautiful handspun yarns and felted art at Spinning on the Edge. 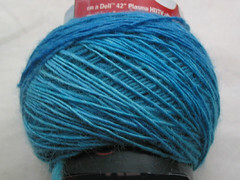 I especially liked the tentacle basket, Otto in the Water, the fishies, and this pile of handspun. 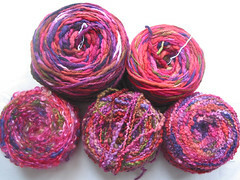 Also happened upon Maitri's Dragonfly Cottage Fiber Studio. The page layout had sent me running before, but this time I stopped to make sense of it and looked at the Wabi-Sabi Wooly Wonder Batts. If you scroll down, there are links to past batts that are just beautiful. If you make it all the way to the bottom, the "Word to the Wise" spoke to me. It's advice to follow your vision, your dream, even if it's crazy or unexpected or shocking to anyone else. As a beginner spinner working in mostly isolation, I have felt the need to get feedback from the outside. Is what I'm doing okay? Does it look good? Is it right? Am I on the right track? What do you think? And it makes sense, to want feedback, especially when you're just starting out. But, I need to start looking from the inside out, to find what my vision is, what I want to make. And it doesn't have to be earth shattering or amazing, like those linked above. And maybe it's really too soon to get anywhere without getting more experience. Hard to create what you want when you don't know materials, tools and techniques. At the same time, I have been thinking about what I want to make, and making decisions along the way, even if it's not so "conscious" or "self-conscious". Every time you create, you make decisions, you decide. Notes: Most notes are in yesterday's post. 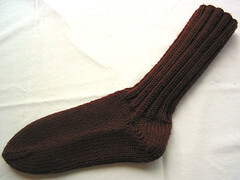 The heel uses the same short row technique as on the Pom Squad Socks on Magknits. 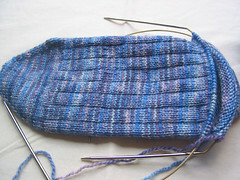 When I got to the toe, because of the foot decreases, I had an odd number of stitches on each needle. 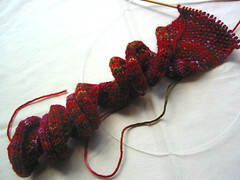 I simply decreased as usual and kept 1 stitch between decreases, instead of the usual 2. 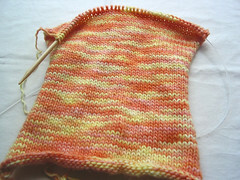 At the end of the last row, I moved the last (unknit) stitch to the opposite needle and kitchenered in the usual way. Any tightness I was worried about is not noticeable. 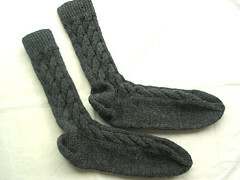 They're warm and sturdy, and best of all, done! Can you believe it, this brought my WIP count down to 47! Incredible! It didn't last, of course. 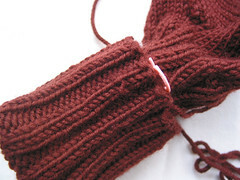 I started a pair of wristwarmers, a holiday gift. 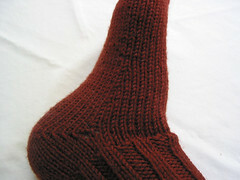 And I'll soon start another couple of holiday gifts. I think 50 is my new threshold, though. No going above 50! 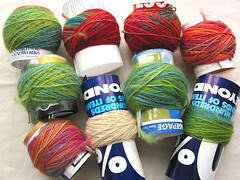 Can you tell I haven't been in a plying kind of mood? 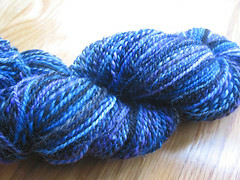 It's the last of the Winderwood Farms blue faced leicester, which I'm sure came out much thinner than the first 2 oz I spun a few weeks ago. 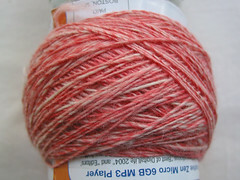 What I said about this BFL not being as soft as Fleece Artist's BFL - not true. I pre-drafted a bit and suddenly it felt very soft. Pre-drafting has become my friend. 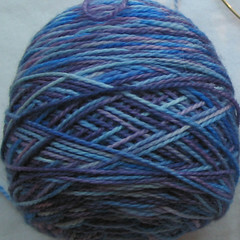 This was tougher to spin; the weight of the spindle seemed to work against me. I wanted a looser single for a looser ply, but without more twist, the spindle wanted to fall to the ground (and did a couple of times). 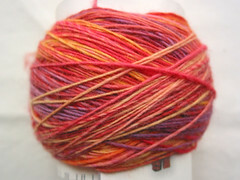 The merino is very soft and the colors are brilliant sunset; looking forward to seeing how it comes out. 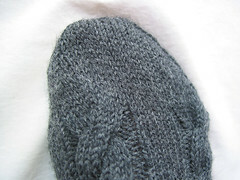 After turning the heel, I began a series of decreases for the foot so that it wasn't so balloon-like; the resulting fit is very snug (hopefully not too snug). 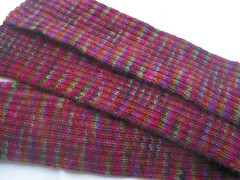 Sock 2 cuff ribbing was done on the circs, and feels a heck of a lot tighter. I wonder if I was negligent in choosing the right needle size?? Bleh, it doesn't matter. 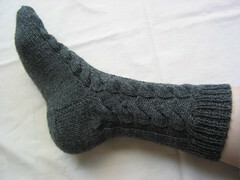 They are not the prettiest socks, just good, sturdy, hard-wearing socks that will keep my feet warm on days like today. Look, I made a mistake! 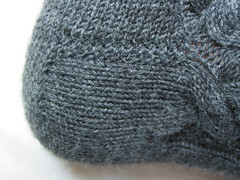 See that little bump in the ribbing? 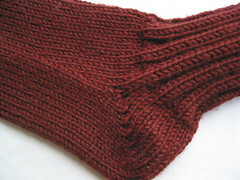 Didn't notice until 6" were done and couldn't bring myself to care enough to redo all that ribbing. 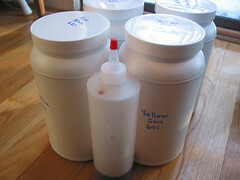 Came across this: Crock pot dyeing (she has a photo gallery of her projects which was inspirational to browse through). 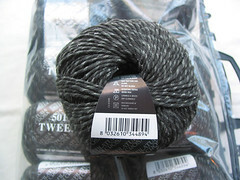 I may try this out, dye some more roving. 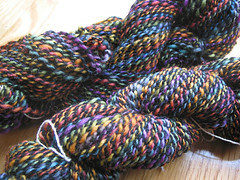 Natasha has been enabling, er, encouraging me, so my near future will include more roving dyeing.